Small GTP-binding proteins such as RhoA, Rac1, and Cdc42 are involved in regulating cell signalling pathways and impact a wide range of cellular processes, functions, and morphology. They bind and hydrolyze GTP, thus being switched from the activated form to the inactivated form. The most prominent family of small G proteins is represented by the Ras superfamily of proteins. The Rho subfamily belonging to this superfamily consists of proteins like RhoA, Rac1, and Cdd42. These proteins have been shown to be involved in the regulation of actin dynamics, thus playing a crucial role in processes like cell movement, intracellular transport, and organelle development. While RhoA affects actin stress fibers, Rac1 exhibits effects on lamellipodia and Cdc42 on filopodia. In the past, the activation of small G proteins (i.e. 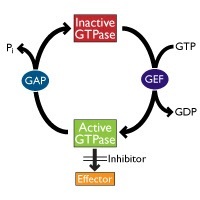 the transformation of the GDP-bound form to the GTP-bound form) could only be measured in pull-down assays. The assays make use of effector proteins which specifically bind to the activated forms of small G proteins. Coupled to beads these proteins can be used to pull-down the activated small G protein from a cell lysate. Cytoskeleton Inc. introduced a new format of this approach a few years ago. With the G-LISA technology, the effector proteins which selectively bind to activated small G proteins are coupled to 96 well plates, making it possible to run an ELISA-like activation assay. To help you to choose the right activation assay format for your application, take a look at this short video. Up to now, researchers had to order full 96 well plates to start using the G-LISA technology. And you can even try all 3 small G proteins with one kit! Are you interested in the G-LISA technology? Or if you’re already using it, how does it compare to other methods?